Whan-Yen is the name of dessert, made of ice & syrup. in the summer here in Thailand. Hope everyone enjoy this icon set. This icon is for Windows, up to 48x48 dpi for XP and 256x256 dpi for Vista. hi, I have a blog and I would like to make a post tutorial "how to change your desktop icon" (in italian, I'm italian... sorry for my bad english). Can I have your permission to show the stamps of my desktop? and of course, I will put your name and the link to this page. love these! Very pretty. Nice work! Could I use these as Cutie marks for My Little Ponies? I will give credit. Its ok if you don't want me to. These are so nice! Great job! Wow very nice icons *^* ! Tysm! I love the book, the diary, the cat is the bus... I love everything on this set! How can I download the icon one by one?? Thanks! And very very beautiful! I'm using them now, very beautifull. Thanks! 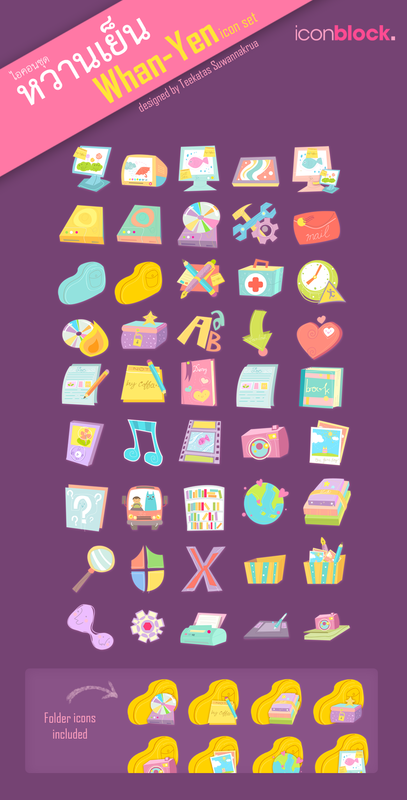 Love love love your icons! You are such an amazing artist! I helped my sister download some of your icons and a wallpaper earlier, now I've gotten some icons for myself. Your art is so adorable!! I wish I could draw and make things as well as you. How do you change picture files into icon files? Aaaah ;S, noo meeu nn daa !! NN tah baixando ! !